Medicinal marijuana use is on the rise in Florida. 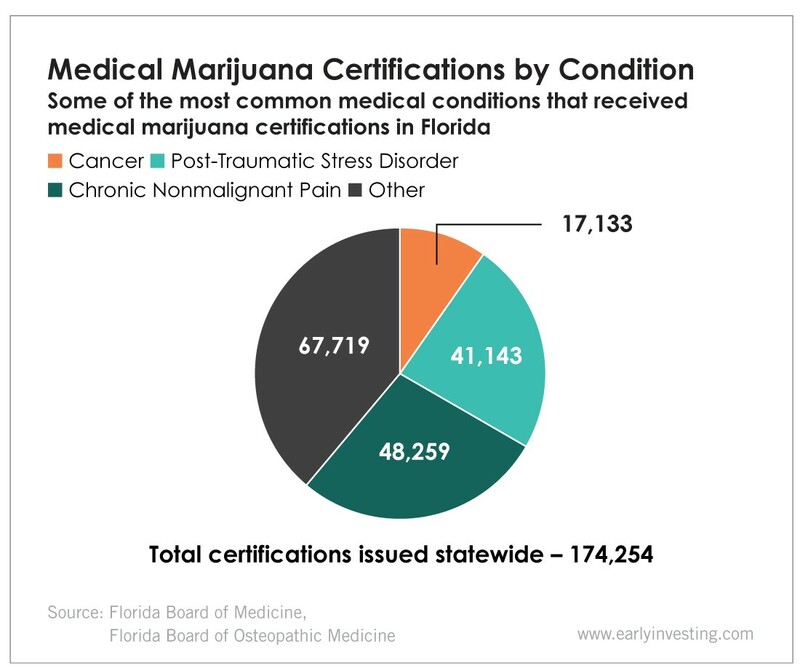 According to a report from the Florida Board of Medicine and the Florida Board of Osteopathic Medicine, from January 1, 2018, to September 30, 2018, 1,070 physicians provided a total of 174,254 medical marijuana certifications to qualifying patients. Some of the most common conditions being treated were chronic pain, post-traumatic stress disorder and cancer. Medicinal marijuana certifications were also given to patients suffering from epilepsy, glaucoma, Crohn’s disease and multiple sclerosis. The number of Floridians using medical marijuana grew from 19,494 in June 2017 to 136,274 in September 2018 (patients can get multiple certifications). And it will likely keep growing – newly elected Governor Rick DeSantis said during his gubernatorial campaign that he would support Florida voters’ approval of medical marijuana. I am going to implement the will of the voters. They passed medical marijuana overwhelmingly… When that happens, then we shouldn’t play games with it, we should simply implement it. DeSantis’ stance is a welcome one for the medical marijuana industry – and the patients that need the relief medicinal marijuana can supply. After voters legalized medical marijuana in 2016, the state’s legislature banned smoking medical marijuana and the state’s health department issued draconian regulations that stunted the industry’s growth. Yet the industry still managed to grow. And it’s expected to continue growing – with sales potentially approaching the $1.1 billion mark by 2020. It will be interesting to see how the market evolves in 2019. As medical marijuana legalization spreads across the country, the opportunities for cannabis companies are looking better and better. Perhaps some promising startups will emerge to compete for Florida’s market share… something the Early Investing team will be on the lookout for.